Some dishes welcome the chard leaves but not the stems, some do both, but I tend to have bags of chard stems in the fridge. . . .for quite some time often. I just unearthed a bag of rainbow chard stems and found them perfectly fine. The ends had browned a little but nothing a little trim couldn’t fix. 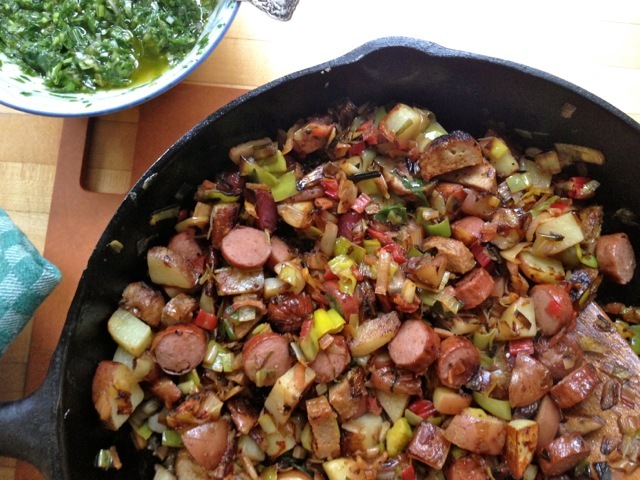 Their color alone whets the appetite but made into a hash with leeks (also forgiving and also yellowing a bit), potatoes and leftover hot dogs (from yesterday’s bbq) they make a perfectly satisfying dinner. Since it was just my 8-year-old and me for dinner tonight we didn’t even need an egg on top. One dish; the fridge is a bit tidier; and we’re both full. Hash with Whatever You’ve Got . . .
Heat 2 tablespoons oil in the largest skillet you have over medium-high heat. Add the leeks and chard stems and a few pinches of salt. Saute over fairly high heat for a few minutes until softening. Add the potatoes and a bit more salt and mix well. Continue cooking until the potatoes are browning and tender. Add the leftover meat, if using, and warm through. 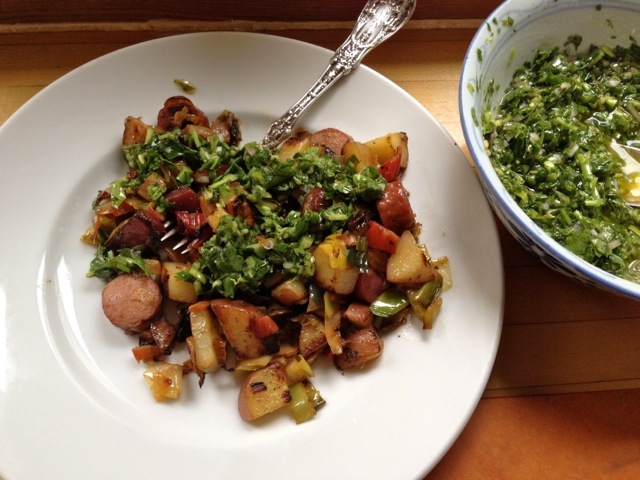 Top with the green sauce (below) or with any kind of salsa or simply fresh parsley or cilantro or any other herb. Mix everything together well and taste and adjust seasoning with salt and or lemon juice or vinegar. This sauce is good on most anything . . .
Don’t Do What I Do . . . 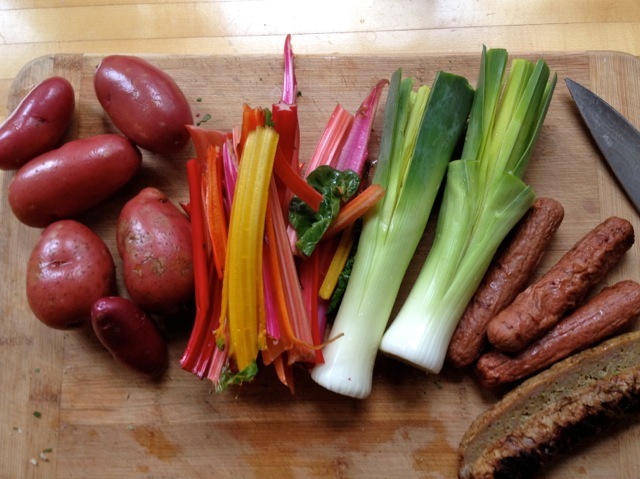 I enjoyed the chard blog. I love chard, stems and all. I was thinking about julienne the stems lengthways, steam and use like spaghetti. I done that with zucchini, using a mandolin to julienne them using mostly the skin. Steam them lightly and put sauce and cheese on top. That sounds like a great idea Richard!